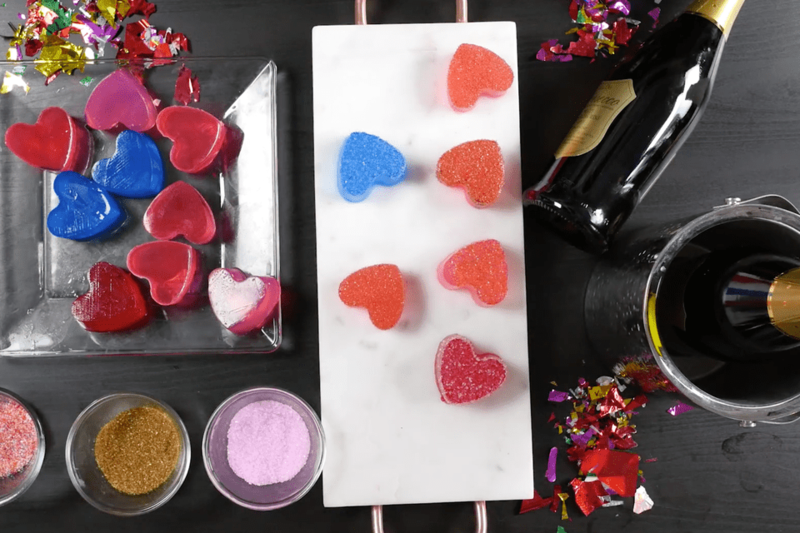 These glittery champagne jello shots are a very grown-up way to celebrate any romantic occasion or add a festive touch to a party. You can use a mold or make them in a baking dish and cut them into squares. Edible sanding sugar gives these treats an elegant shimmer that's sure to impress your guests or that special someone. You don't need to use your best champagne for these shots. It's fine to buy an inexpensive bottle of bubbly, and it need not be from France. Go ahead and use prosecco or an American sparkling wine. Save the good bottle to serve chilled and undiluted. You can choose your motif. There are many creative jello molds out there for making fun-shaped shots. Red and pink hearts are great for Valentine's Day, engagement parties, wedding showers, or bachelor/bachelorette parties. Green shamrocks will rock St. Patrick's Day parties. For a card-playing party, use molds for hearts, diamonds, spades, and clubs. Use red and green for Christmas. Make shots in your team colors for game-watching gatherings. To make enough for a crowd, you can double or triple the recipe. Tip: Because these are made with champagne, they will pack less of a punch than liquor-based jello shots. Six of these champagne jello shots would equal a small 4-ounce glass of champagne. You could split a batch with your sweetie. But as with any alcohol-containing treats, be sure to monitor your intake and stay safe. Prep your muffin pan or baking dish by lightly spraying it with cooking spray and then wiping out any excess or residue. In a small pot or deep pan add champagne and 2 ounces of the lemon-lime soda. Sprinkle the gelatin on top and let sit for at least 2 minutes to “bloom.” You’ll see a ripply film form on the top. Heat the mixture on medium-low heat and whisk continually until the gelatin is dissolved. Be careful not to let the mixture come to a boil. Remove from heat. Add in remaining lemon-lime soda and let cool a bit. Add a few drops of food coloring and stir to mix. Pour the mixture into the cavities of your muffin pan or into the baking dish. Refrigerate for 4 to 24 hours to set. The shots should slide easily out of the muffin pan but you may need to do some careful prodding with a small offset spatula. If using a baking pan, cut the jello into squares and then carefully remove. Dip the tops into a shallow bowl of sanding sugar. Arrange the shots on a tray and let the fun begin.